Left: #FeesMustFall activist Mcebo Dlamini. 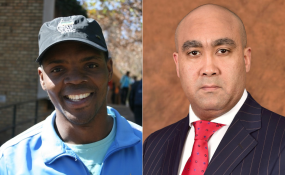 Right: Former head of the National Prosecuting Authority Shaun Abrahams. A lawyer representing former University of the Witwatersrand student leader and Fees Must Fall activist Mcebo Dlamini, claims that the case against his client is politically motivated. Advocate Thembeka Ngcukaitobi told the packed Johannesburg Magistrate's Court on Friday that former head of the National Prosecuting Authority (NPA) Shaun Abrahams played a role in rejecting Dlamini's representations. Abrahams retired from the NPA in August. Through his legal team, Dlamini attempted to make representations to the NPA for the organisation to consider mediation or a settlement procedure. He said that they received a one-line response on October 5 that their representations had been rejected by the NPA. "There is an application that we intended to raise. That application revolves around the constitutionality or the lawfulness of the prosecution. The substance of the application is that there has been a violation of Section 179 of the Constitution by the prosecution...The basis of that violation is that Abrahams had a meeting at Luthuli House with high-ranking officials. "In that meeting, he [had a discussion], among others, with high-ranking officials, including [the] minister of justice. One of the items was Fees Must Fall. It is apparent his prosecution is politically motivated," said Ngcukaitobi. Dlamini intends to make further representations to the new NPA leadership, which Ngcukaitobi claimed was not "tainted by political manipulation" of the case. If that is not successful, he intends to approach the High Court for a judicial review. "The basis of that review is that the prosecution was politically motivated and can't result in a fair trial... The reason to prosecute [should] be declared unlawful and set aside. It is not my intention to delay the trial," said Ngcukaitobi. Dlamini, a Fees Must Fall activist, is facing charges of theft, assault with intent to cause grievous bodily harm, public violence, possession of a dangerous weapon, malicious damage to property and being in the country illegally. Ngcukaitobi said the charge of being in the country illegally related to the Department of Home Affairs and didn't directly implicate the Fees Must Fall leader. Ngcukaitobi won't be available from April 15, 2019 because he will be an acting judge in the Land Claims Court. Prosecutor Steven Rubin asked for the matter to be put on the roll for trial and said he wouldn't be available for the entire month of March next year because he had another trial in the High Court. The State is expected to call 15 witnesses. One of them is Shangaan-speaking, which would require a Shangaan interpreter. The three-day trial is expected to begin on April 9.